"People often lament that in our celebration of Christmas, we tend to lose sight of its true meaning. Not to be a contrarian, but I don’t think the two are mutually exclusive. "At Christmastime, we celebrate family, giving, tradition, friendship, community, love, goodwill and so much else that is great and good about human existence. These sublime experiences and institutions are wonderful precisely because our Savior, in whom goodness inheres, created them. "With proper godly perspective, delighting in these glorious gifts actually enhances our focus on God; it doesn’t diminish it. Of course, we must discipline ourselves, if it doesn’t occur naturally, to give thanks to God and to consciously savor Him and His gift of life to us. "This time of year, we celebrate Christ’s incarnation — His birth, His earthly example and His miracles and teachings. We humbly bow at the Crucifixion, marvel at the magisterial Resurrection and gratefully acknowledge our regeneration salvation in Him. We cherish that He is truth, the judge and the very giver of life." HT his December 22, 2017 column, "A Celebration of Life, posted at The Patriot Post. The Tax Foundation has done yeoman's work in keeping American's informed about Tax Cuts and Jobs Act over the past several months -- you can follow that progress at their Tax Policy Blog. "Congress today took a historic step toward rewriting the U.S. tax code for the first time since 1986. Our Taxes and Growth model shows that this legislation over the next decade will boost GDP by 1.7 percent and wages by 1.5 percent, while creating 339,000 additional jobs. "For far too long, the U.S. has lagged behind its trading partners with an extremely high corporate tax rate and a worldwide tax system. Now the U.S. will have a much more competitive corporate rate at 21 percent, as well as a territorial tax system that only taxes businesses on income earned domestically. Businesses no longer will be discouraged from reinvesting their profits in America. "Admittedly, the bill isn’t perfect and represents a balance among political compromises, fiscal constraints, and pro-growth policies. The special tax treatment of pass-through businesses could lead to costly, time-consuming tax planning opportunities and disputes. Full expensing—potentially the most pro-growth tax policy lawmakers could adopt—is only made temporary, which means the growth effects will be somewhat muted. And shifting to a territorial tax system, while important, will involve difficult decisions about base erosion rules that will require careful analysis to prevent any unintended consequences. "Nevertheless, it is encouraging to see Congress work through the very difficult, challenging process of reforming the tax code and producing an end product that makes important progress. We at the Tax Foundation have worked hard to educate federal and state lawmakers about the trade-offs involved and will continue to do so throughout implementation of the bill." Hodge's statement includes links to additional information. The National Taxpayers Union issued press releases comment both the House of Representatives and the Senate on passing the Tax Cuts and Jobs Act (TCJA -- here and here, respectively. Also at their blog, Demian Brady also provides a summary of his USA Today op-ed in which he describes how TCJA "will simplify the Code." At the NTUF blog, Andrew Moylan cites calculations that TCJA passage "will save taxpayers 210 million hours and $13 billion in compliance costs. Because 30 million people will no longer have to endure the frustration of itemizing, they can reclaim the time and out-of-pocket expenses they used to suffer at the hands of the tax code." The Council for Citizens Against Government Waste also cheered final passage of tax reform, applauding the House and Senate for passing the Tax Cuts and Jobs Act. The noted, "It is the bast holiday gift possible from the federal government." Congress.gov provides a link to H.R. including links to the House and Conference reports, the CBO cost estimates, and the 28 roll call votes. Fox News provides a summary analysis of TCJA here. Two days ago, the Tax Foundation provided "preliminary details and analysis" of TCJA. Finally, the Tax Policy Center's analysis can be found here. UPDATE (12/21/17): At the Washington Free Beacon, Ali Meyer provides two articles. The first is an analysis of families that will receive tax cuts under TCJA, while the second article is on final passage. At the Washington Examiner today, Tim Carney says that people are opposing "this tax cut because they've been told it's a tax hike . . . This may surprise you if you rely on major media outlets for your news." The Heritage Foundation's Adam Michel analyzed the 2017 TCJA, on Tuesday. "Republicans have enacted the Tax Cuts and Jobs Act, the largest tax overhaul since 1986. While many people seem to think that the legislation favors the rich, it actually delivers the largest relative tax cuts to the middle class. That is clear if you dig beneath the surface of estimates from the liberal Tax Policy Center (TPC). "TPC’s new analysis shows tax changes for the final GOP bill for households by income quintile (or fifth). But the data is not presented in a neutral context to understand the relative sizes of tax cuts for each group. I present TPC data in context in the table below." According to the Arlington Sun Gazette's Scott McCaffrey today, "Leadership of the Arlington Chamber of Commerce is not happy with action by the County Board to create housing-conservation districts, but plans to stay engaged as the plan is fleshed out during 2018." "County Board members on Dec. 16 adopted what they’re calling a “policy framework” as part of an effort to stem the exodus of affordable-housing units from the increasingly gentrifying community. "County officials say they are taking steps to meet a need, but the local business organization suggested it was a rushed, ready-fire-aim approach without the requisite community input. “This plan will limit the development potential of a property, impede access to financing for property owners to reinvest in these properties, and could discourage redevelopment of older housing,” Chamber officials said in an e-mail to their membership after the vote. "In addition to concerns about a lack of transparency, Chamber officials voiced anxiety about limitations put into effect on those who want to develop townhouses, which in recent years have begun to rise in place of razed older apartment units in areas like Westover. "The business organization had asked County Board members to defer action until 2018, but on a 4-1 vote (with John Vihstadt against), board members voted to move forward. “Thousands of Arlingtonians living in market-rate rentals simply could not afford to live in our community if this housing were to disappear,” board chairman Jay Fisette said of the 14,000 or so market-rate (non-subsidized) affordable units that remain in Arlington." "Kate Bates, president of the Arlington Chamber of Commerce, said despite the organization’s disappointment on the vote, it would work with county officials as they continue their efforts on the plan in 2018. "The Chamber proved over the past year that it is not to be trifled with on public-policy issues. When the County Board in December 2015 approved beefed-up policies on rules regulating those towed from private property, the business organization and its allies went to Richmond and convinced both the General Assembly and Gov. McAuliffe to support measures overturning that action and slapping further handcuffs on the ability of Northern Virginia localities to regulate trespass towing. "While the Chamber contends the board’s Dec. 16 action on housing districts went too far, some activists counter that it doesn’t go far enough, and want the county government to enact a new crop of historic districts, which provide the local government significantly more regulatory power over some neighborhoods. But establishment of those districts is time-consuming and can lead, as has been the case in Westover where one is being considered, to a significant split among property owners." “Thousands of Arlingtonians living in market-rate rentals simply could not afford to live in our community if this housing were to disappear,” board chairman Jay Fisette said of the 14,000 or so market-rate (non-subsidized) affordable units that remain in Arlington. “If we are to remain a diverse, inclusive, sustainable community, we must do what we can to preserve these rentals,” Fisette said." The Board discussion was based on a staff presentation, a County Manager's report to the Board, and letters from the Planning Commission and Arlington's Alliance for Housing Solutions (Agenda Items No. 45.A, 45.B, 45.C, and 45.D on Saturday's Board agenda). We growled on June 13, 2015 about the course the County Board chose for affordable housing. "Worried about the loss of nearly 17,000 apartments affordable to low and middle-income residents, the Arlington County Board on Saturday made it tougher for private property owners to convert multifamily buildings into single-family homes." "Arlington County pours 5 percent of its operating budget into a revolving loan fund that has helped nonprofit developers build or rebuild “committed affordable” units for the poorest residents, including a $6 million loan for 294 units in Park Shirlington made last month. But families at 60 percent of the area’s median income have experienced a drop in the number of privately owned “market rate affordable” units from about 20,000 in 2000 to 2,780 in 2016." Two weeks ago, we growled about Arlington County being identified as one of the nation's five richest counties. So one would think that county bureaucrats didn't need to go "hat-in-hand" to the federal government for a $25,000 grant to fund an Arts Truck. Consequently, we were surprised to read in ARLnow.com today that "Arlington County has received a $25,000 federal grant to fund programming for its Art Truck." In addition, the County Board will appropriate $25,000 of county tax dollars in "one-to-one matching funds." "The National Endowment for the Arts awarded the grant, which will be matched by $25,000 in county money for a total of $50,000 in funding, in June. The Arlington County Board voted unanimously Saturday (December 16) to receive the grant. "The grant will help with expenses, commission original artwork and hire artists for programming. The Art Truck is part of approximately 1,000 projects to receive federal money. "The County Board approved purchasing the mobile arts and performance venue last year to partially fill the void left by the closure of the Artisphere in Rosslyn. "It travels to locations like farmers markets, neighborhood events, public libraries and after-school events, with its projects ranging from pop-up galleries to performances. “The main goal of the Arlington Art Truck is to demystify the artmaking process, to tear down the four walls, turn it inside out and bring the ‘museum’ to the people,” Michelle Isabelle-Stark, director of Arlington Arts and Cultural Affairs, said in a statement earlier this year. "The total $50,000 funding help pay for artists’ fees, transportation and hotels ($26,130); vehicle costs ($8,455); technology needs ($4,027); printing, art and office supplies ($5,638); and marketing and advertising materials ($5,750)." You can read more about the NEA funding grant at the county's Economic Development Department website here. The County Manager's 7-page report to the Arlington County Board (Agenda Item No. 23 on Saturday's December 16, 2017 agenda) authorizing acceptance of the arts grant includes the NEA letter. As the Tax Cuts and Jobs Act reportedly gets closer to final passage this week, all we've heard from Democratic politicians is how most of the tax cuts are going to the rich. Well then, what is a $25,000 art truck grant going to one of the five richest of America's 3,141 counties? And if Arlington arts lovers are looking for real arts galleries, they need do little more than head east on US Route 50, and follow it to the U.S. Capitol. For additional information, Wikipedia provides a list of museums and art galleries in the District. HT House Republican Conference (gop.gov). According to Usgovernmentdebt.us as of December 18, 2017, the national debt is $20,492,949,732,212.36, and the "Federal Debt per person is about $62,804." "The federal government collected record total tax revenues of $443,715,000,000 in the first two months of fiscal 2018 (Oct. 1, 2017 through the end of November), according to the Monthly Treasury Statement. "Despite these record tax revenues, the federal government still ran a deficit of $201,761,000,000 for those same two months. "That is because the government spent $645,476,000,000 in October and November." "Prior to this year, the $432,362,820,000 in total taxes (in constant 2018 dollars) that the federal government collected in the first two months of fiscal 2016 was the greatest amount of taxes the federal government had ever collected in the first two months of a fiscal year." The Treasury Monthly statement for FY 2018 through November 30, 2017, can be found here. 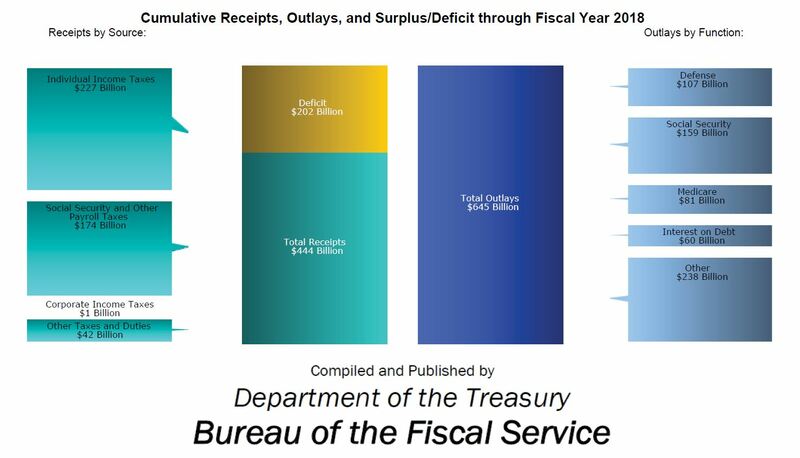 He included the following graphic, which appeared in the Treasury Department report"
"The national debt is at a post-war record high and rising unsustainably. Fixing the debt will take a bipartisan effort to slow spending growth and increase revenues. The first step, however, is to agree not to make the existing fiscal situation worse. "These unprecedented fiscal challenges present an opportunity for policymakers to come together and restore fiscal sustainability. Doing so is critical to securing both our fiscal and economic futures, and it will increase the resources and flexibility needed to address other critical priorities." The Arlington Sun Gazette reported today that "(r)esidents of the Arlington Partnership for Affordable Housing’s Arlington Mill Residences would receive free wireless Internet courtesy the Arlington taxpayers, under a proposal slated for County Board consideration on Dec. 16." "County staff are asking for authorization to spend $95,400 in funds to provide free Internet service to the 122 committed-affordable units in the complex, located just north of Columbia Pike. “For many of these low-income households, who make on average $40,000 before tax, the $45-$75 per month cost for a good high-speed Internet connection is unaffordable,” said Nina Janopaul, president and CEO of the Arlington Partnership for Affordable Housing. "The entire effort will cost about $140,000, with the remainder coming from outside contributions. Funding will support a pilot program that might expand to other low-income communities across the county." A new initiative, Arlington Digital Inclusion, supported by the Department of Technology Services (DTS) and Department of Community Planning, Housing and Development (CPHD), will leverage the County’s existing dark fiber assets (ConnectArlington) to provide free broadband internet connectivity to tenants of the Arlington Mill Residences for a period of three years. Currently, there are 122 committed affordable units (CAFs) at Arlington Mill Residences and 159 children are currently residing at the development. About half of all households (61) do not currently subscribe to an Internet/data service. This program would provide free, in-unit high-speed Wi-Fi access to every unit. It would also help alleviate the cost of Internet/data service (which can range from $50-$75/month) for those households currently paying for the service. This initiative is the result of the collaboration between DTS, CPHD, APAH, and other partners to be selected by APAH. "The allocation of $95,400 to APAH will be fully funded by the FY 2019 Columbia Pike TIF base budget. In addition, APS will realize some savings. APS currently has a program called MiFi which provides personal devices and associated wireless service to students who would not otherwise have access, and therefore could not utilize digital learning resources. This initiative will eliminate the need for APS MiFi to provide such personal devices and associated wireless services to students residing at Arlington Mills Residence, saving APS on average $100 per device and $16.95 per month for service fees, as well as ensuring both students and other residents have access to higher bandwidth service." Ah, the generosity of the County Board, the County Manager, and county staff? I venture they would be nowhere near as generous if that $95,000 was coming out of their payroll benefits. CNSNews.com's Terry Jeffrey reported yesterday, "The five richest counties in the United States when measured by median household income are all suburbs of Washington, D.C.. . . ."
"According to the American Community Survey's new five-year estimates (2012-2016), the five richest counties in the country are: Loudoun County, Va., where the median household income was $125,672; Falls Church City, Va., where it was $115,244; Fairfax County, Va., where it was $114,329; Howard County, Md., where it was $113,800; and Arlington County, Va., where it was $108,706." Jeffrey pointed out that Arlington's median household income "was 96.5 percent greater than the national median." In case you wondered about the inclusion of Falls Church, for example, he pointed out, "The Census Bureau treats independents cities—such as Falls Church City, Va., and Fairfax City, Va.—as counties, which is why they are included on the list." In addition, he reported, "The nationwide median household income in 2012-2016, according to the Census Bureau, was $55,322. 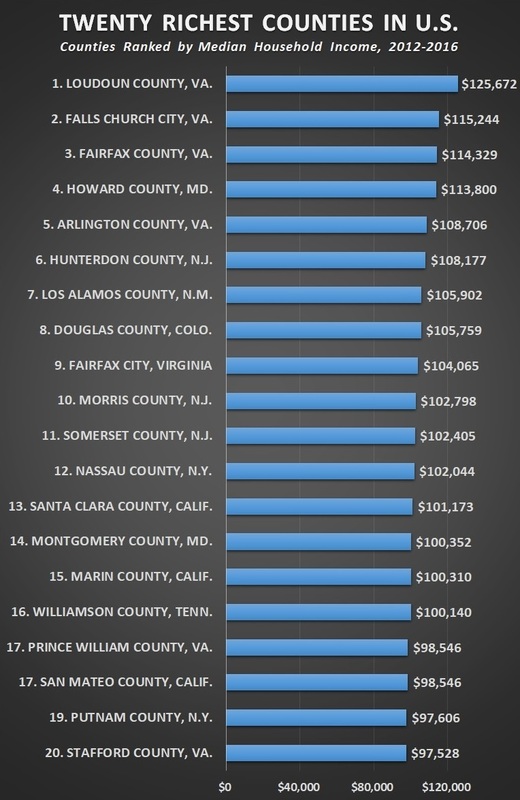 That means that the income in the nation's four richest counties—Loudoun, Falls Church City, Fairfax County, and Howard County—were all more than double the national median." Many of the reader comments are worth reading. There are currently 613. Here's another link to the article. For more information about CNSNews.com, click here. HT Walter E. Williams' Collection of Quotations. Natalie Johnson of the Washington Free Beacon reported today the "U.S. Navy Squandered $4 Billion Due to Congressional Failure to Pass Budget," saying that taxpayer money is lost "due to inefficiencies caused by continuing resolutions." "The U.S. Navy has wasted roughly $4 billion in taxpayer money over the past six years due to the repeated failure by Congress to pass a budget that fully funds the military, the secretary of the service said Monday. "Spencer said the Navy could have otherwise used the wasted funds to purchase a squadron of F-35 fighter jets, two Arleigh-Burke-class destroyers, 3,000 harpoon missiles, or 2,000 tactical Tomahawk missiles. "Congress has forced the military to operate under stopgap spending bills for the past eight years to avert government shutdowns amid partisan divisions. The temporary budgets freeze defense funding, forcing the Defense Department to shuffle funds from modernization and hiring to support current missions." "Echoing sentiments from senior defense officials, Spencer said stopgap resolutions and budget constraints have been the "most harmful impediment" to rebuilding service readiness and achieving modernization. "Funding issues born of the Budget Control Act and continuing resolutions have taken a toll on readiness, maintenance sites, and have also cost us time and resources that we cannot buy back," he said. "Urgency is the battle cry." Most taxpayers know by now, as reported by Fox News on Saturday, "The U.S. Senate voted just before 2 a.m. ET Saturday to pass a sweeping tax overhaul worth roughly $1.4 trillion, putting the Trump White House a big step closer to its first major legislative victory – and many Americans closer to a tax cut . . .The vote was 51-49, with Republican Bob Corker of Tennessee the only member of the GOP to side with the Democrats in opposition." And, here, the accounting firm, KPMG, identifies today the House conferees, In addition, KPMG links to a Congressional Research Report (CRS) for "Senate Rules Restricting the Content of Conference Reports." "That will be important. When the chambers pass different versions of a bill, conferees are appointed by both the House and the Senate to produce a “conference report” that is satisfactory to the majority of conferees from each chamber. (More on this later, after the table.) The closer the two sides are going into conference, the easier the resulting process. "The good news for proponents of the bill is that McConnell is right: the Senate bill moved in the House’s direction on several important issues, and was already identical on key points. Both move to chained CPI. Both retain the state and local tax property tax deduction, capped at $10,000. After a floor amendment adopted last night in the Senate, both expand 529 college savings accounts to apply to some primary and secondary education expenses. Both feature a 20 percent corporate rate. That does not mean, however, that the two versions are identical." He then provides a helpful side-by-side comparison of various provisions of the House and Senate versions of the bill, staring with the individual income tax rates and brackets. For example, the House version has four brackets while the Senate version has seven brackets. Meanwhile, our friends at the National Taxpayers Union issued a press release on Saturday applauding Senate passage of the "Tax Cuts and Jobs Act," saying that while not perfect." bill, "it is a phenomenal improver over the status quo." The WSJ's Washington Wire explains today "How Senate Republicans Passed the Tax Bill (behind the WSJ's paywall, however). HT Founder's Quote Database, The Patriot Post. County Board to Rely on Rabbits to Pay for Metro? According to an online story in Thursday's Arlington Sun Gazette, "Cue the Dusty Springfield soundtrack: It appears Arlington leaders are a’wishing and a’hoping that the federal and/or state governments will ride to the rescue in support of additional funding for the beleaguered Metro system." "The Arlington County Board’s fiscal 2019 budget guidance to County Manager Mark Schwartz, adopted Nov. 28, calls for no additional local-taxpayer funding to the transit agency’s operating budget for the next fiscal year beyond a 3-percent rate of growth agreed to earlier. "Exactly how that rabbit will be pulled out of the hat was not explained, and may be a false hope: state leaders have shown only limited interest in helping localities with Metro funding, and the Trump administration is not proving itself a champion of public transit. "In the current fiscal year – July 2017 to June 2018 – the Arlington government will funnel about $70 million in cash to the Washington Metropolitan Area Transit Authority. About half of that funding comes directly from taxpayers, the other half from state and regional sources. Total fiscal 2018 funding to the Metro system from Arlington was up 25 percent from a year before. "County Board members earlier this year added three-quarters of a penny to the real estate tax rate to provide more funds to the Metro system, an increase that added roughly $56 to the tax bill of the owner of a single-family property." We stated our position in a January 21, 2017 Growls" "Don't Subsidize Metro, Privatize It!" NOTE: For information about Dusty Springfield, see her Wikipedia entry. To listen to her 1964 hit Wishin & Hopin, click here. HT Thomas Sowell, "Collection of His Favorite Quotations."